Couscous is a kind of pasta made from fine granules of semolina. These small pasta grains make a key constituent in Moroccan and North African cuisines. It is traditionally prepared by boiling or steaming and is served as a side dish. However, you can also use it to make a vegetarian main course recipe. 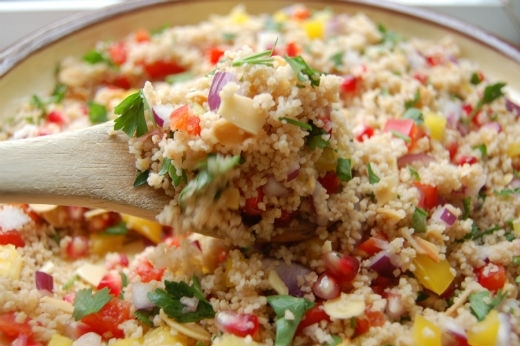 It is really simple to make a vegetarian main dish using couscous. Just take vegetables of your choice (raw or frozen), cook them and mix with couscous boiled in water. Season these with salt and pepper and serve hot. Utensils: Medium size saucepan, stirring spoon, microwave oven, stove, serving dish. In a medium size sauce pan, bring 1 ½ cup water to boil and add half cup dry couscous to it. After bringing it to a full rolling boil, let the couscous cook on medium heat until the water is absorbed and it makes a thick paste (10 to 15 minutes). Take one cup of frozen vegetable mix and defrost it in a microwave. If you don’t have a microwave, cook the vegetables on the stove top for several minutes, until they are completely thawed. Combine the thawed veggies and the couscous mixture in a medium size mixing bowl or serving pan. Add two tablespoons of olive oil, ¼ cup chopped fresh basil and parmesan cheese (shredded) and mix well. Season your dish with salt and black pepper and serve hot with breadsticks and your favourite salad. In a large saucepan mix the broth, water and olive oil and bring it to boil. Once the mixture starts boiling, add couscous to it. Cook for a couple of minutes and then remove from heat. Cover the saucepan and let the mixture sit for five minutes. Thaw one cup frozen peas in the microwave and mix them with chopped dill, freshly grated lemon zest and season with salt and pepper. Add this mixture to the couscous and mix thoroughly. Sprinkle shredded parmesan cheese on the top and serve hot with breadsticks as a main course meal.